Celldex released interim data on the ReACT trial of rindopepimut in recurrent glioblastoma at the Society for Neuro-Oncology (SNO) on November 24, 2013. I am always cautious on rushing out with an interpretation of data from a clinical trial shortly after it is released. There are many different data points in a trial and it often takes clinicians and investors weeks, months or years to parse the data. I find that when I make quick judgments concurrent with the release of data that I often misinterpret key points. I am also reluctant to rely exclusively on company press releases. There is a tendency to highlight positives more than negatives; this is just human nature. Hence, the release of my views on the ReACT data comes about three weeks after its initial release and a conference call by Celldex. This note summarizes what I found most interesting on my looking through the data. I guarantee that it is not an exhaustive review. There was a great deal of anticipation of this data following a release by Celldex on August 12, 2013. The Company said that based on early evidence of anti-tumor activity, including stable disease, tumor shrinkage and investigator reported response, it decided to add an expansion cohort of approximately 75 patients to cohort 2 of this trial. This cohort was comprised of 25 patients with recurrent glioblastoma patients who were refractory to Avastin who were then treated with a combination of rindopepimut and Avastin. Investors reacted very positively to this press release and in the month that followed, the stock rose strongly and steadily from $20 on August 12th to a high of $38 on October 1st. It has since retraced and has been pretty much trading around $25 to $28 per share since October 1st. The initial reaction following August 12th seems to have been in expectation of extremely positive data. The actual data, as detailed in this note, was encouraging but perhaps not to the extent that some investors had hoped for. I believe that the interim data on ReACT is encouraging. There is a significant hint of meaningful biological activity and of a possible increase in median overall survival. The data did not reach statistical significance at this interim look, but I would not expect that in an interim look. Management guidance is that final results on ReACT will be available in 2H, 2014. Perhaps the SNO meeting from November 13 to 16 will be the forum for presentation of the data. There may be some additional data presented during the May 30 to June 3 ASCO meeting. The key event for the stock in 2014 is likely to be the release of final topline data on ReACT, which as I just suggested could be in November 2014. There will also be an interim look by the Data Monitoring Committee (DMC) on the ACT-IV trial of rindopepimut in newly diagnosed glioblastoma patients probably in 4Q, 2014. The most likely outcome is that the DMC will recommend that the trial continue; if the data is trending positively, it won’t be released at that time. Investors will probably see the results of the ACT IV trial in late 2015 or early 2016 although management has not given guidance. 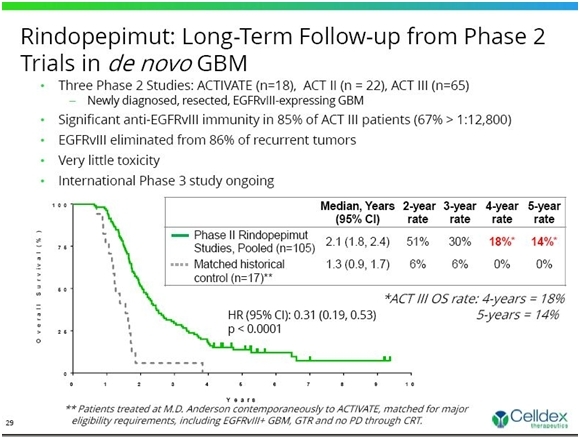 Although there could be some meaningful data on rindopepimut in May at ASCO, it is probable that important stock moving information is about 11 months away. In regard to CDX-011 which is now known as glembatumamab vedotin, the METRIC phase II trial in triple negative breast cancer began on December 2, 2013. It is expected to enroll 300 patients at up to 100 sites in the US, Canada and Australia. Celldex is guiding toward an enrollment timeline of 12 to 18 months, but they are hopeful that they can accrue in 14 months as was the case in EMERGE. This would result in completion of enrollment in 4Q, 2014 to 1Q, 2015. Topline results would likely be available in late 2015 or early 2016. Success in the trial could result in accelerated approval so that the drug could come to market in late 2016 or early 2017. The action on the stock in 2014 is likely to be driven by phase I results on CDX-1127; this drug works in a complementary way to the checkpoint inhibitors: BMY’s $1+ billion blockbuster drug Yervoy and the highly touted anti-PD1 inhibitors that are in late stage development. The stock could also be driven by phase I results for CDX-1135 which has a mode of action comparable to Alexion’s (ALXN) $1 billion blockbuster drug Solaris. There is hope that CDX-1135 could have significant potential in ultra-rare orphan diseases. Data on the solid tumor cohort of the phase I trial of CDX-1127 is likely to be presented at the May 30 to June 3, 2014 ASCO meeting. Data on the hematological cohort could be presented at the December 6 to 9 American Society of Hematology ASH. The Company has said that it would update investors on plans for CDX-1135 in dense deposit disease in February 2014 at the year-end conference call for 2013. Management has not given much of an indication of what to expect other than to say that it is very difficult recruiting patients for this disease. Celldex (CLDX) has just announced a financing in which the Company has issued 7.0 million shares and will receive net proceeds of $163 million. If the Green Shoe is exercised, as seems likely, shares issued and net proceeds would be 8.05 million and about $187 million, respectively. The Company had $136 million of cash as of the end of 3Q, 2013. On a pro forma basis, it has raised the cash position to $323 million. The recent operating cash burn has been $17.5 million per quarter so that at that rate the Company can fund 18.5 quarters of operations as opposed to 7.8 quarters pre-offering. The number of shares outstanding is increased from 81.0 to 89.1. At the recent price of $25.88 the market capitalization is now $2.3 billion. This removes the financing overhang for the Company, which was emerging as an issue, and this is a positive for the stock. I think that it is inappropriate to use the term fortress balance sheet for a company burning through $70 million a year. However, this is an exceptionally strong balance sheet for an emerging biotechnology company. I like the fundamental story very much and the removal of the financing overhang is a positive. However, it looks to me like the next six to eleven months may not have that many significant catalysts. Phase I data on the effects of CDX-1127 at ASCO in late May or early June is the earliest that we could see something that could move the stock. I am still reluctant to buy the stock at current levels as the valuation at a market capitalization of $2.2 billion has a lot of expectation for success built into it. Also, the action of the stock in 2013 has been outstanding as the stock has quadrupled from $7.46 at the beginning of the year. This may have attracted some momentum players who will be inclined to take profits. Perhaps I am too cautious and the stock will run away from me or perhaps some big pharma will swoop in and acquire Celldex. However, my best judgment is that there will be a better entry point on the stock. Recurrent glioblastoma patients have failed standard of care which is surgery followed by radiation and temozolomide. In this setting, Avastin is the main drug that is used in this setting even though its efficacy is not robust. It was approved on the basis of two trials which showed objective responses of about 20% and with a duration of response of about four months; there was no demonstrated effect on survival. In approving Avastin in this indication, I understand that the FDA looked at results in every single patient and reached the conclusion that it enhanced quality of life through reducing neurological symptoms. ReACT is divided into two groups: Group 1 will be about 70 patients who have not received Avastin. Patients in group 1 are randomized to receive Avastin plus rindopepimut or Avastin plus KLH (an immunostimulant used in constructing rindopepimut). Group 2 was initially comprised of about 25 patients who had failed Avastin and were next given Avastin in combination with rindopepimut; there was no control arm. This group was expanded in August 2013, when Celldex announced that encouraging early results in the 25 patients in Group 2 led to a decision to expand the group by 73 new patients. The primary endpoint for both group 1 and 2 is progression free survival (PFS) at six months. The treatment regimen is identical in both groups with patients receiving Avastin every two weeks in addition to monthly rindopepimut or a control vaccination until they progress. The key secondary endpoint is median overall survival (OS). The action in expanding Group 2 indicated that investigators were seeing promising results from the trial. The first data from this group was published in an abstract on November 11. On November 25, Celldex released more extensive and mature data on Group 2 that was presented in an oral presentation on November 24 at SNO. This oral presentation also presented data on Group 1 patients for the first time. The just released data was from an interim analysis and the final topline results won’t be known until late 2014 or early 2015. While interim results can offer a meaningful indication of final results, they are subject to change as the data matures and more patients are enrolled. Group 2 did not reach the primary endpoint of the trial which is progression free survival at six months. For group 1, there was no data on progression free survival at six months. It is not that surprising that Group 2 did not reach its primary endpoint at this interim look and it is quite possible that it will not be reached at final analysis. There is a growing body of evidence is that immunotherapies often may not be that effective in slowing progression of the disease but can have a favorable effect on survival. One explanation for this is that they may not be as effective as chemotherapy or targeted therapy in shrinking the size of the primary tumor, but are more effective against metastases which may be more responsible for patient deaths. I think that the data on OS was encouraging in Group 1. The rindopepimut plus Avastin arm showed median overall survival of 12.0 months versus 7.9 months in the control arm of Avastin plus KLH; this was a 4.1 month improvement. These results were not statistically significant as the hazard ratio was 0.43 within a confidence interval of 0.13 to 1.44 and resulted in a p value of 0.016. However, this represents a strong trend and there is good reason to hope that with the addition of more patients and maturing of the data, that statistical significance ultimately will be achieved. The plan is to enroll about 70 patients in Group 1 and this data was on the first 40. If the data holds up, a 4.0 month increase in median overall survival for an aggressive cancer like recurrent glioblastoma would be considered a significant clinical advance. Avastin was approved in recurrent glioblastoma on the basis of an improvement in progression survival and with no increase in median overall survival. In terms of regulatory review, OS trumps PFS even though it is a secondary endpoint in the trial. In Group 2, there was no control arm as this was an open label trial. Avastin plus rindopepimut showed that median overall survival was 5.6 months within a 95% confidence interval range of 3.2 to 6.7 months. There are no drugs approved for the treatment of recurrent glioblastoma patients who have failed Avastin and hence no clinical trial data on OS. Data from eight physician led trials suggests that a variety of drug regimens can produce OS of 2.6 to 5.8 months. However, these physician led trials were performed in patients who expressed EGFRvIII (perhaps 30% of the patients) and those who did not. There is strong evidence that EGFRvIII expression causes a more aggressive disease course and shorter OS. Because Group 2 patients were all EGFRvIII expressors, the comparison with historical data may understate the effect of rindopepimut plus Avastin. The data can only be taken as encouraging and suggestive that rindopepimut has meaningful clinical activity in recurrent glioblastoma in both patients who have received Avastin and those who no longer respond to Avastin. Avastin is the only widely used drug approved in this setting even though in clinical trials, it did not show an improvement on median overall survival and was approved on the basis of an improvement in progression free survival. The data just released suggests that rindopepimut combined with Avastin may improve median overall survival in Group 1 and Group 2 patients groups, but this has not yet been shown in a statistically significant manner. Are There Implications for Other Cancer Vaccine Products? There have been a long string of failures in clinical trials of cancer vaccines. The only such product that has been approved is Dendreon’s (DNDN) Provenge. 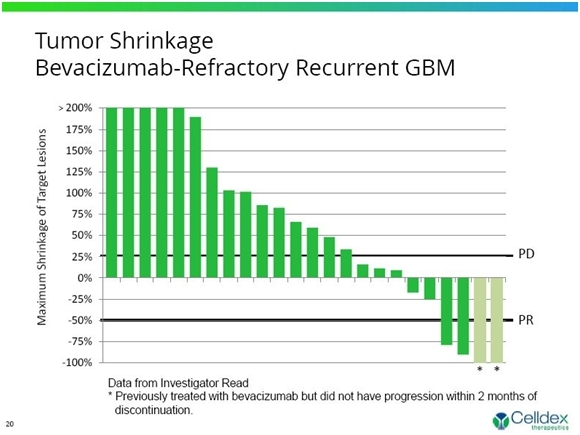 So how encouraged should we be about the results in ReACT having positive implications for other cancer vaccines in development for glioblastoma from Northwest Biotherapeutics (NWBO), ImmunoCellular (IMUC) and Agenus (AGEN)? I don’t have a good answer. Skeptics on cancer vaccines believe that tumors develop mechanisms that protect the tumor from the immune system. They maintain that attempts to bolster the action of the immune system (the goal of cancer vaccines) are doomed to failure. Celldex management has said that perhaps the most important data coming out of this trial is that rindopepimut was able to induce an immune response in both newly treated recurrent glioblastoma patients and those who had failed therapy. This could be encouraging for the other cancer vaccines. On the other hand, rindopepimut appears to act most importantly through creating antibodies much as is seen with vaccines against bacteria and viruses while the other three activate T-cell responses. Hence, this data may not necessarily bode well for the other cancer vaccines. Final data on the ReACT trial should be available in 2H, 2014 according to management guidance. There could be some more interim data presented at ASCO. There will be an interim analysis on ACT IV in 4Q, 2014, but this will just be for safety reasons. The most likely outcome is a recommendation to continue the trial with no other information being provided. Final topline data on ACT IV could be available in late 2015 or early 2016. In Group 1, 48 of the planned 70 patients are now enrolled in the trial and interim results were presented for the first 40; 20 received rindopepimut plus Avastin and 20 received Avastin plus KLH (an immune stimulant that is part of rindopepimut). Of these patients 27 are being followed and 12 of these 27 are receiving therapy. It was not specified what happened to the remaining 13 patients; they may have progressed, died or dropped out of treatment due to some safety or other issue. Patients like these who are EGFRvIII-positive, typically have a poor prognosis. In this setting, historical data suggests median overall survival is 13 to 15 months and few patients survive beyond two years. In the broader general population where EGFRvIII patients are only 30% of the population, median overall survival is about 18 months and there are some longer term survivors. In terms of median overall survival, the rindopepimut arm showed median overall survival of 12.0 months versus 7.9 months in the control arm for a 4.1 month improvement. These results were not statistically significant as the hazard ratio was 0.43 within a confidence interval of 0.13 to 1.44 and resulted in a p value of 0.016. However, this represents a strong trend and there is good reason to hope that with the addition of more patients and maturing of the data, that statistical significance ultimately will be achieved. If the data holds up, a 4.0 to 5.0 month increase in median overall survival for an aggressive cancer like recurrent glioblastoma would be considered a significant clinical advance. Avastin was approved in recurrent glioblastoma on the basis of an improvement in progression survival and with no increase in median overall survival. The actual endpoint of this trial is progression free survival. Although a secondary endpoint, median overall survival trumps progression free survival. 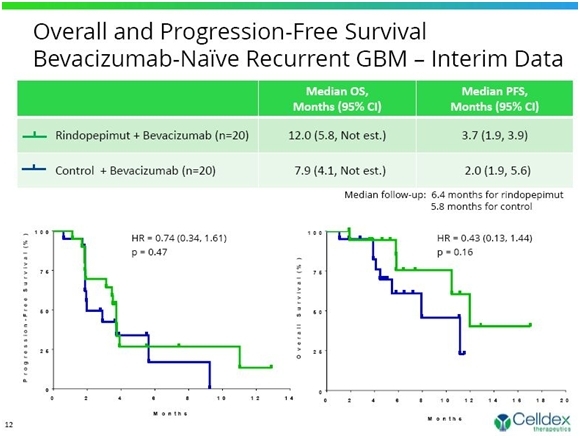 The progression free survival trend was not as strong but showed a numerical improvement over Avastin alone of PFS of 3.7 months versus 2.0 months. The hazard ratio was 0.74 within a confidence interval of 0.34 to 1.61 with p=0.47. The encouraging median overall survival data and not so positive progression free survival data is often (usually?) seen with immunotherapy. Tumors sometimes grow larger for a time even in patients respond and experience an increase in survival. In the rindopepimut arm, 14 of 18 (78%) patients with measurable disease saw some tumor shrinkage versus 9 out of 16 (56%) patients on the control arm and 70% of patients in the rindopepimut arm had stable disease or better for greater than 2 months versus 55% in the control arm. During the conference call there was a lot of discussion about the difficulty of determining whether there was or was not progression. Different clinicians looking at the same data sometimes reached different conclusions on the degree of shrinkage of the tumor. This may be an issue for the FDA, but there is the precedent that Avastin was approved on the basis of progression free survival. . The Kaplan-Meier curves for median overall survival and progression free survival are shown in the following chart. The Kaplan-Meier curves as seen above can be highly variable over time. While the results are consistent with reaching statistical significance, there are many variables that can change these curves to make them better or worse. Still, this early look is pretty exciting and there is reason to hope that statistical significance will ultimately be achieved. If these data hold up, they would represent the first clear evidence of an improvement in overall survival in recurrent glioblastoma. Celldex believes that patients whose tumors express EGFRvIII have a worse prognosis than other patients. The data seems to support this hypothesis. In the control group of 20 patients who received Avastin plus KLH, the median overall survival was 7.9 months. In two earlier trials of Avastin done by Genentech in the overall recurrent glioblastoma population (with and without EGFRvIII expression), median overall survival was 9.3 months. There were 25 patients enrolled in this part of the trial in which patients who had failed on Avastin and then progressed were subsequently given Avastin plus rindopepimut. The question immediately arises as to why patients who had failed Avastin were given the drug again. Tumors can suppress the immune response that is trying to eradicate them through impairing dendritic cell maturation, altering tumor endothelium and potentially decrease in immune cell infiltration. There are data that suggests that Avastin may be able to partially block this effect and optimize immune responses. Avastin has been shown to enhance anti-tumor effects of other drugs in animal models. Of the 25 patients, 6 are being followed for survival and 1 of these 6 is still receiving treatment. Eighteen of the patients have died underlining the rapid progression of the disease. Median overall survival was 5.6 months within a 95% confidence interval range of 3.2 to 6.7 months. Progression free survival was 1.9 months within a 95% confidence interval range of 1.8 to 2.8 months. There was, of course, no control arm in this study. The Company cited data from eight other studies that suggested that the weighted average survival in patients who are Avastin refractory is about 2.6 to 5.8 months. This data includes both EGFRvIII expressing and non-expressing patients. Remember that the Company hypothesizes that non-EGFRvIII expressing patients have better life expectancy. There is the strong suggestion that Avastin plus rindopepimut provided better overall survival in this group, but this is not definitive. The primary goal of this trial was to show that 20% of patients remained progression free at six months. The trial did not reach this endpoint as only 2 of 25 patients showed an objective response (one CR and one PR). With no comparative data available to define expected outcome for EGFRvIII-positive patients who have failed bevacizumab, the goal of 20% progression survival was probably too ambitious. Two other patients showed an objective response, but there was a question as to whether they were or were not refractory to Avastin. This is shown in the following waterfall chart. Tumors have the ability to suppress the immune response and this is often cited as a reason that we have had no many failures in cancer vaccine trials. Across all ReACT patients, the immune response created by rindopepimut was encouraging. About 85% of patients developed significant anti EGFRvIII antibody titers which increased with time on study. The majority (67%) developed significant anti-EGFRvIII antibody that were maintained for greater than six months. There was a good correlation between the humoral (antibody) response at days 29 and 57 and overall survival for these patients. It was very encouraging that a strong immune response was seen even in refractory patients, responses that were consistent with those seen in newly diagnosed patients. Celldex stated that this maybe the most impressive results seen in the study as these patients have received radiation and chemotherapy and had an immune suppressive tumor. Still, they are still able to mount immune response titers equivalent to minimally treated patients with responsive tumors. The great attraction of cancer vaccines is that they are very safe relative to chemotherapy and targeted therapy. Across both Group 1 and Group 2, rindopepimut plus Avastin was very well tolerated (dosing up to 13+ months). 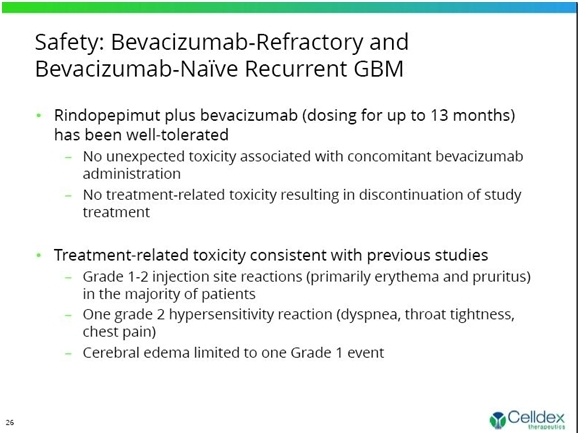 There were no unexpected toxicities associated with concomitant Avastin administration and there were no treatment-related toxicities resulting in discontinuation of study treatment. Adverse events were consistent with prior studies of rindopepimut. The following chart shows the safety data from the ReACT trial. Celldex has done three earlier studies in newly diagnosed glioblastoma patients. These were open label studies without a control group and are subject to some skepticism when compared to historical controls. However, the data on long term survival is encouraging. Across three earlier phase II studies of rindopepimut, survival data remains consistent and suggests a substantial and continuing survival benefit in comparison to independent control datasets (see chart below) at the median and at all other time points evaluated. The pooled overall long-term survival results continue to be consistent with the ACT III Phase 2 study (18% for 4-years and 14% for 5-years). The Phase 3 registration study, ACT IV, is modeled after the ACT III study. This is shown below. Celldex is currently conducting a phase III trial in newly diagnosed, EGFRvIII expressing glioblastoma patients. This patient population is as identical as possible to that in ACT-III. It is a randomized double-blind trial in over 200 sites in 20 countries. The study will enroll 450 patients and is designed to meet FDA requirements within an end point of overall survival. To-date, over 350 patients have been randomized and accrual is accelerating as more sites are being opened in Western Europe. Of the 450 patients, about 374 will be more fully resected and have minimal residual disease. These will form the basis for the primary intention to treat analysis. The remaining, less resected patients are included as an observation arm. There will be event driven interim analysis for both utility and efficacy to occur at 50% and 75% of events. The data monitoring committee will see their first unblinded data set at first interim analysis, with 50% of events. They will look at disease free progression and median overall survival. It is possible, but not likely that the trial could be stopped at either of these two interim looks because of efficacy or futility, but this is not likely. The first interim look will likely occur in late 2014 or early 2015. The final data should be available in late 2015 or 2016 and topline data released a few months later. So right now we're still basically on track with what we've been saying previously.